Click here to download the demo version of Tasty Planet: Back for Seconds. If you would like to download the full version of Tasty Planet: Back for Seconds, you can purchase it by clicking here. Installing is easy. On Windows just double click on the tastyplanet2demosetup.exe file that you downloaded (tastyplanet2fullsetup.exe for the full version) and follow the onscreen instructions. Once installation is complete, you can start the game by clicking on the Tasty Planet - Back for Seconds icon on your desktop or by opening it through the start menu. To do so click Start > All Programs > Tasty Planet - Back for Seconds > Tasty Planet - Back for Seconds. On Mac double click on the tastyplanet2demo.dmg (tastyplanet2full.dmg for the full version). You will see a progress bar followed by the Tasty Planet: Back for Seconds window. 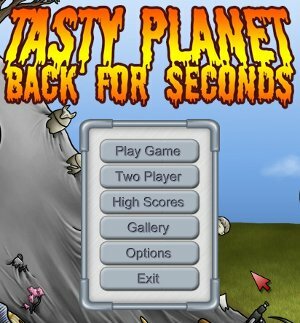 Double click on the Tasty Planet - Back for Seconds icon to run the game. You can also move the Tasty Planet - Back for Seconds application to your hard drive and run it from there. Play Game: Start the single player game. Two Player: Start a two player game. High Scores: Compare your best level times with other players from around the world. Gallery: View all of the different objects that you have eaten. Options: Change volume and controls. More info here.